Heartache Motel-Lots of Elvis fun! What fun! Three of the most clever and entertaining cozy mystery writers working today have teamed up to put together 3 stories, each using their signature sleuth, set in the same setting but not overlapping. The cozy reader’s dream. 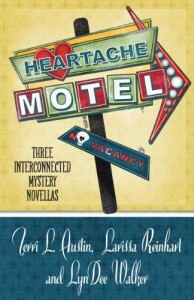 All three stories are set in the Heartache Motel in Memphis, TN at Christmas time. In Diners Keepers, Loser’s Weepers the crew from Diner Impossible by Terri L. Austin gets in the middle of an Elvis impersonator contest complete with dead bodies. In Quick Sketch by Larissa Reinhart, Cherry Tucker and her boyfriend Todd try to help Todd’s cousin with an illegal poker game and, of course, that’s sure to turn out well! In Dateline Memphis, Richmond Telegraph reporter Nichelle Clarke gets a lot more than she bargained for when she takes a tour of Graceland to get a souvenir for her mom. This last one is my personal favorite. I really love the Nichelle Clarke series. All three of these are fun, smart and well-written. If you are a fan of any of these authors or a fan of cozies that are just slightly on the sharper edge of cozy, I can definitely recommend this.